Whenever we’re going somewhere, we bring our iPhone cable. Nobody wants to be caught with a dead iPhone with no way to charge it. Well, what if the ubiquitous cable you carry around with you everywhere could also be used as a stand for your phone? That’s the idea behind Une Bobine, and we think it is great. 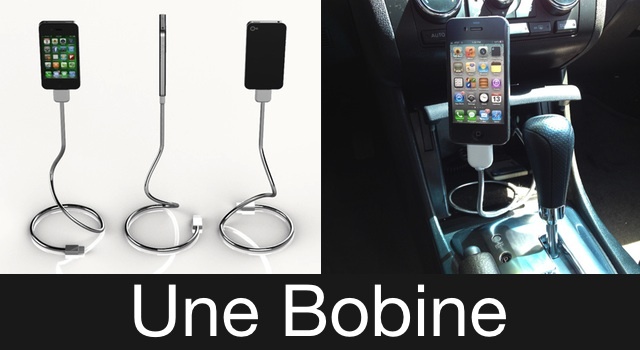 This Kickstarter project, Une Bobine, is made out of a “metal gooseneck material” that allows the cable to flex into position, and then stay put as it supports the iPhone’s weight. Plug in your iPhone, position the cable, and it will stay put. It can hover next to your Mac or perhaps keep your iPhone off the floor when plugged into the wall wart. This is a very clever implementation, and it is a perfect example of what we love to see on Kickstarter. If you want your very own Une Bobine, you need to back the project for $25 USD. The good news is that it include free shipping worldwide! As of publication, they have gone over $1,300 of their $9,800 USD goal, and they have 39 days to go, so it is looking good for the future of this project. If you want yours, don’t wait — pledge away.